Just Deep cjrecordsbes11 ? 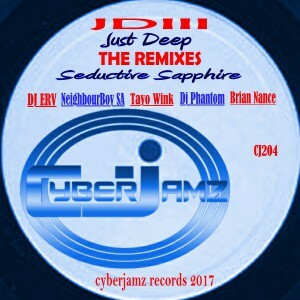 Cyberjamz Records. You thought that would be enough..but NO !! Walter Phant Ellison (Dj Phantom) adds a fantastic techy mix without loosing it?s soul while delivering his own dope interpretation and SoulCat (SammyRock & Catherine Harris Rowell (Dj Housecat(la gata de fuego) comes correct wth a nice edit mix of our own.Finally deep house extraordinaire Brian Nance closes out with a banging remix which makes this package complete and ?JUST DEEP? ! coming end of Oct 2017 ? Cyberjamz Records. pick up parts One & Two out now Toupee Records.